A sudden spinning sensation or dizziness accompanied by nausea, ringing and buzzing in the ears can be debilitating. This is often referred to as vertigo and results from an impaired sense of balance and equilibrium. When someone experiences vertigo they may feel that they are sinking or falling and that the room is spinning around them. It is speculated that vertigo occurs as a result of conflicting messages coming in to the central nervous system from the ears, eyes or muscles. There can be multiple causes ranging from blood pressure disturbances, allergies, anemia, viruses, fevers and nutritional deficiencies to more serious causes such as neurological diseases or an interrupted supply of oxygen to the brain. All causes of vertigo need to be investigated by a qualified healthcare professional. 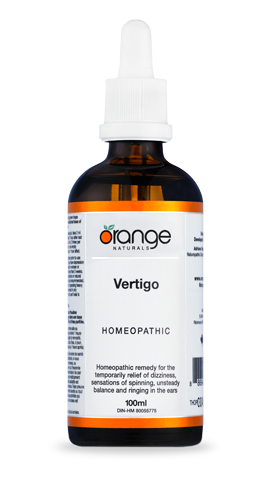 However, Orange Naturals Vertigo Homeopathic drops may help to provide temporary relief of some of the symptoms associated with vertigo such as dizziness, spinning, imbalance and ringing in the ears. Homeopathic remedy for the temporarily relief of dizziness, sensations of spinning, unsteady balance and ringing in the ears and vertigo. Adult: for general dosing, take 1ml, 3 times per day under the tongue or in a little water. For acute symptoms, take 1ml every 30-60 minutes (up to 12 times per day). When symptoms improve, resume general dosing. Shake well before each use.